In Almost Every European Country, Bikes Are Outselling New Cars : Parallels For the first time on record, bicycles outsold cars in Spain. More bikes than cars were sold in Italy for the first time since World War II. Indeed, bicycle sales have outpaced new-car sales across the Continent. Is it a long-term trend or just a reflection of the recession in much of Europe? 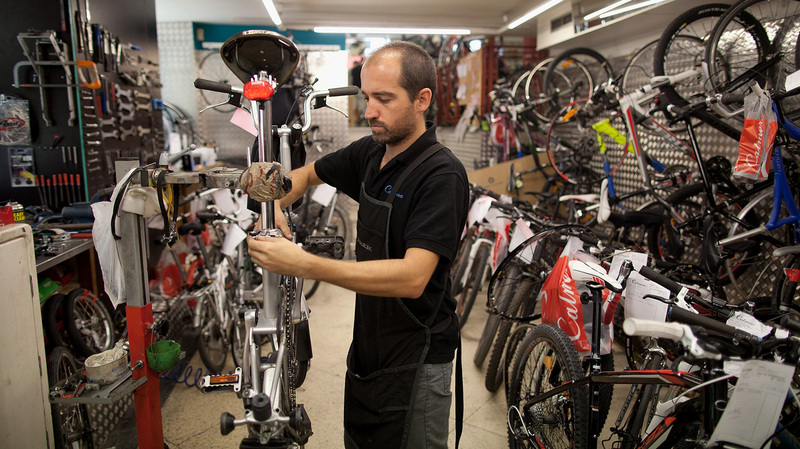 A mechanic repairs a bike at Calmera bike shop in Madrid in September. As car sales slump across Europe, bicycle sales in Spain are outpacing cars — a trend seen across much of the Continent. Indeed, earlier this month, NPR's Lauren Frayer reported that Spain, which has long had a love affair with cars, is embracing the bicycle: For the first time on record, Lauren noted, bicycles outsold cars in the country. But it's becoming a Continent-wide phenomenon. More bikes were sold in Italy than cars — for the first time since World War II. This prompted us to look at the figures across the 27 member states of the European Union for both cars and bicycles. New-car registrations for Cyprus and Malta weren't available, so we took them out of the comparison. Here's what we found: Bicycle sales outpaced new-car sales last year in every one of those countries, except Belgium and Luxembourg. 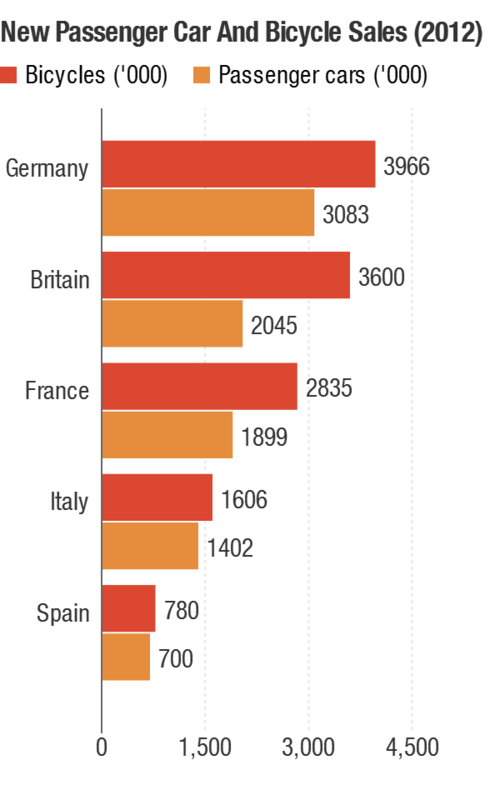 The top five countries by bicycle sales can be seen in the top chart. We decided to delve a little deeper into the figures and see which of these countries had the highest rates of bicycle-to-car ownership. Those states can be seen in the second chart. So, what explains the numbers? Parts of the data can be explained by the slump in car sales across Europe. Car sales reached a 20-year low earlier this year. More recent figures showed they were recovering. This decline coincided with the worldwide recession, which hit European economies particularly hard, though there are signs they may be recovering). The U.S. has fared much better. Last month, car sales jumped to pre-recession levels. But U.S. automakers face another problem: Millennials aren't interested in buying cars. Bike sales, on the other hand, are solid.